The FIDE President Kirsan Ilyumzhinov and the Vice Governor of Ugra Alexey Putin met with the journalists right after the Official Opening Ceremony. At the beginning of the briefing Mr. Ilyumzhinov mentioned that today FIDE and its activities have been going on far better than in 1995 when he started his work as a head of the organization. Nowadays big chess events take place everywhere in the world almost every day. 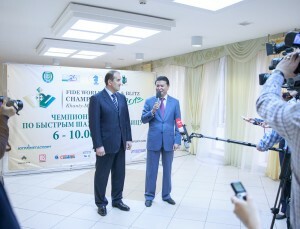 “Just two days ago we closed the FIDE Grand Prix in Greece, and today we are opening the World Rapid and Blitz in Khanty Mansiysk”, – Mr. Ilyumzhinov underlined. - I would like to thank the leadreship of the Khanty Mansiysk Autonomous Okrug and personally Natalia Vladimirovna Komarova for having done all to make Ugra the cultural centre, chess oasis and chess capital of the world. Not a single city, not a single capital can brag of such magnificent chess events that are organized in Ugra. Khanty Mansiysk has held almost all important chess tournaments: four World Cups, World Chess Olympiad, World Women’s Chess Championship, World Rapid and Blitz Championship. Our chess players feel in Khanty Mansiysk like home. In 2010 the World Chess Olympiad took place here, it has become the best olympiad in terms of the organization among the tournaments that were organized in recent years. Ugra is famous not only for organizing big chess tournaments, but also here they love chess, they develop chess for children, they implement chess into the school program. For many regions and countries, Ugra is an example of imitation. Right after the end of the Championship, the World Conference on chess education will gather here 200 participants from all over the world. As you can see, the place was chosen not at random, – resumed Mr. Ilyumzhinov. Alexey Putin has emphasized a big value of chess for Khanty Mansiysk Okrug. “More than 23 000 children study chess in our Okrug. We have successful results not only within Okrug but also outside it. That is why we will do our utmost to support chess development in Ugra. It is a great honor for us to host the best chess players and to organize chess events of highest possible levels. We support and will continue supporting this sport”, – Alexey Andreevich concluded.